If you wish to hide your IP to anonymously browse the internet and overcome censorship, the best proxy tool that can help you do this is NotMyIP. 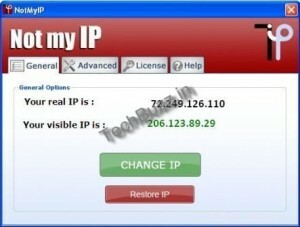 This tool is similar to Hide IP utility. NotMyIP proxy tool uses high quality proxies and is a free version of Anonymity Gateway which is a premium product. You can use Anonymity Gateway for bypassing access restriction like blocked Facebook access, blocked MySpace access etc. You can also bypass download limit that is imposed by file sharing services such as MegaUpload, RapidShare etc. Once you start using NotMyIP, all the traffic (incoming as well as outgoing) is routed via NotMyIP proxies. NotMyIP does not need any additional add-ons, plug-ins or any kind of manual configuration. It works well with most web browsers like Mozilla Firefox, Internet Explorer, Google Chrome and Opera. The best part is that this utility comes with high speed proxies to ensure that the proxy routing works properly at all times. This eliminates the need for users to search for new proxies on the internet. 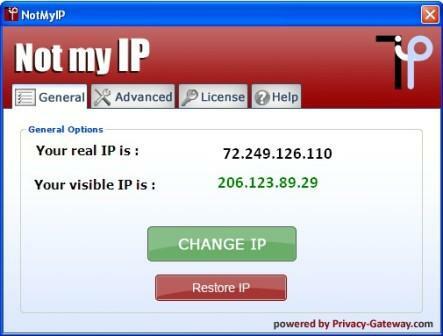 NotMyIP comes with three different IP addresses and three premium US proxies that are available for free. However, you can expect a slow browsing speed with NotMyIP as numerous users share the same proxies.